It's your sister birthday, and you haven't found anything to say. 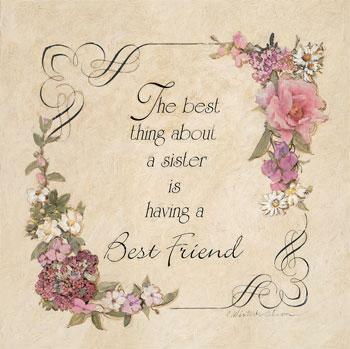 No need to panic, here I have compiled down some of the best sister birthday quotes and wishes for you. Just hope this will work out and you will be able to convey your message. A sister like you is a piece of childhood that can never be lost. A sister is a special gift from Heaven, a gift I will be forever grateful for...happy birthday sis! I would like to thank God for having you as my sweet sister...Happy Birthday sis! Now, after reading these wishes for younger sister, you will no longer be clueless as to what to write on your sister's birthday card. These lines will surely help you in your work. Partying on through, to early hours quite late, your birthday is the day we should all celebrate. Sisters share a special kind of freedom, freedom to share their innermost thoughts, freedom to ask favors, freedom to show their true feelings and simply be themselves. Wish you my sweet sister, a very happy birthday. We are sisters by chance and friends by choice. Wish you many happy returns of the day. Wishing you special happiness, wonderful memories and all the very best on your birthday and for every single day of your life.